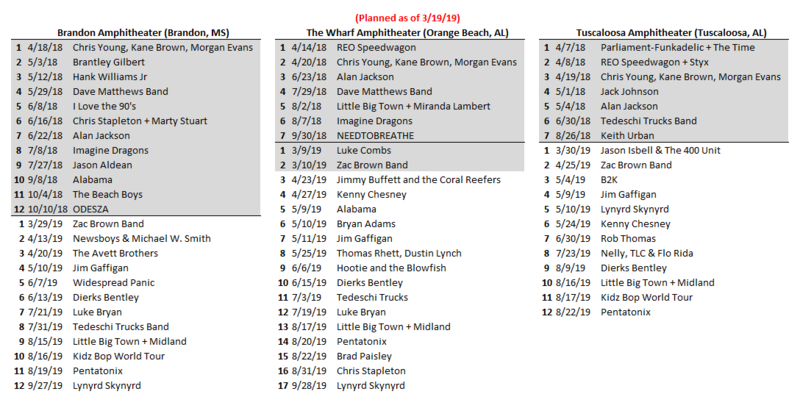 Having the venue is one part, but I'm pretty sure Mississippi is missing concert Promoters who will pay acts up front and take their profits from ticket sales. If Brandon built the venue thinking thr acts were going to take the financial risk, then they are incompetent. Most big name acts use Live Nation as promoters so rarely do they rely on independent promoters. Take Metallica for example, they are promoted by Live Nation. Live Nation books the tour, sets the ticket prices through the ticket providers. Artists signed through companies like Live Nation are paid upfront contractually. They've already been paid a guarantee, the ticket prices you pay goes back to the promoter. They pay the venue and of all that. If there's any money left then that's worked out because the promotion company and the artist. There really are no more independent promoters that deal with big name acts. Now there are still promoters that book clubs and the such. Last edited by sammyreynolds1977; 02-01-2019 at 01:54 PM..
Well, since you're so sharp, know ALL the answers, and are quick to criticize, try googling Oak Mountain Amphitheater and you'll see something that looks like a petting zoo, and some children's areas, what appears to be a car show, and all sorts of things not associated with music. I admitted I'm not familiar with the place, and I gleaned that information from googling. As a matter of fact, I'd never heard of the place until maybe 6 months ago. Give it a try. Google and tell me your impressions, assuming you'd never been there. I'll even give you a link to make it easy. Scroll down the pictures on the left hand side and tell me what you see. There are no captions, so it's easy to see how once could assume they're permanent fixtures. Haha. I still can't rep you ... I just need to spread my love around a bit. Maybe I'll give some to Mississippi Alabama Line. For what it's worth and continuity since I brought the subject up, the city council approved a $4M+ design study for the new amphitheater, and will see if they want to fund it after the design period. I can't imagine spending that kind of money and then dropping the entire thing, so we'll see. Hopefully it will succeed and not become a white elephant if built. Since this thread started, BA has booked like 3 more shows, including Widespread Panic. Jackson haters have derped again. Brandon now has 9 events scheduled for their 6 month season. Those were the days. People did not so easily get their feelings hurt if called a name or someone disagreed with them and there was no pride in being a victim.